With both of my websites i try and add a jquery type side to it so i can add a bit of style and user interaction to my website but i now know that you dont need to have that to make your website as slick and simple, knowing that some jquery examples can also be a bit complicated at times, that’s what i didn’t want my website to be. 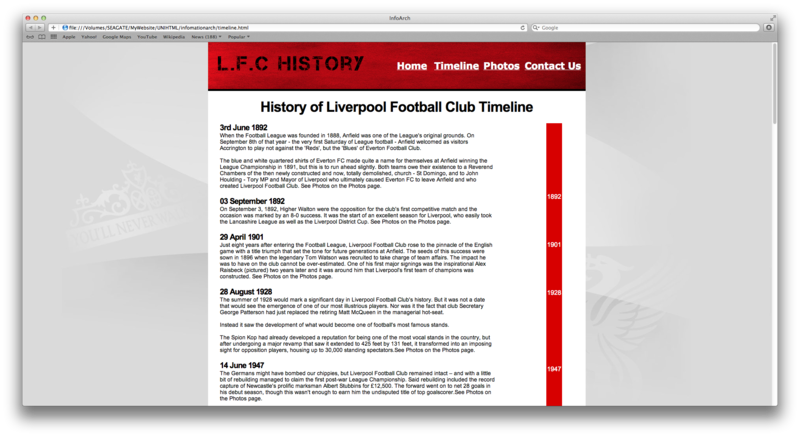 So i decided that with me doing a Liverpool FC history site, i thought that i would apply a timeline where the user would be able to browse the football clubs history, so i decided to browse i couple of websites for example jquerys i could implement them into my website. So i did some experiments with the first one, because i really liked that one and it didn’t go well. I only wanted it to be simple but i tried messing around with the divs and then finally give up with it in the end. 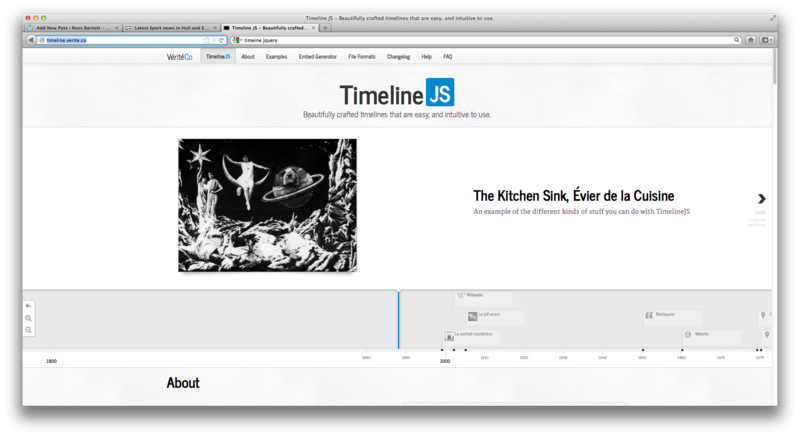 So i decided that instead of implementing Jquery in my website, when tried before with the navigation it didn’t work in my preferred browser, i’d just do my own. The timeline consists of the main events that have happened up till the present day, with the key dates highlighted in bold. Along the side is a red timeline with the dates aligned with the key information on the left. The information has the right amount of detail on each event, because having all of the information i might aswell right a book and the users are more interested in the key dates like Hillsborough 1989 which has more because its a key date in Liverpool’s History and no one can disagree that. Following on from my final idea, i have produced a site map that is my final template on which my website navigation will be based on.